Aiseesoft iPhone to Computer Transfer Ultimate is specially designed to backup all iPhone files, including music, movies, TV shows, podcast, iTunes U, ringtones, ePub, PDF, audio books, camera roll, pictures, voice memos, SMS(MMS), contacts, and camera shot to computer without any loss. What's more, it supports The latest iPhone 5s/5c, iPad mini 2, iPad Air, etc. Aiseesoft iPhone to Computer Transfer can help iPhone users backup all iPhone files, including music, movies, TV shows, podcast, iTunes U, ringtones, ePub, PDF, audio books, camera roll, picture, voice memos, and camera shot, to computer or iTunes with zero loss. iPhone users can transfer the specific SMS/Contacts, all SMS of a specific Contact, or all SMS/Contacts on iPhone to Computer. Also users can backup the iPhone SMS and Contacts to this program, edit or delete the SMS/Contact informations. This iPhone Transfer is highly compatible with the latest version of iPhone, iPad and iPod. 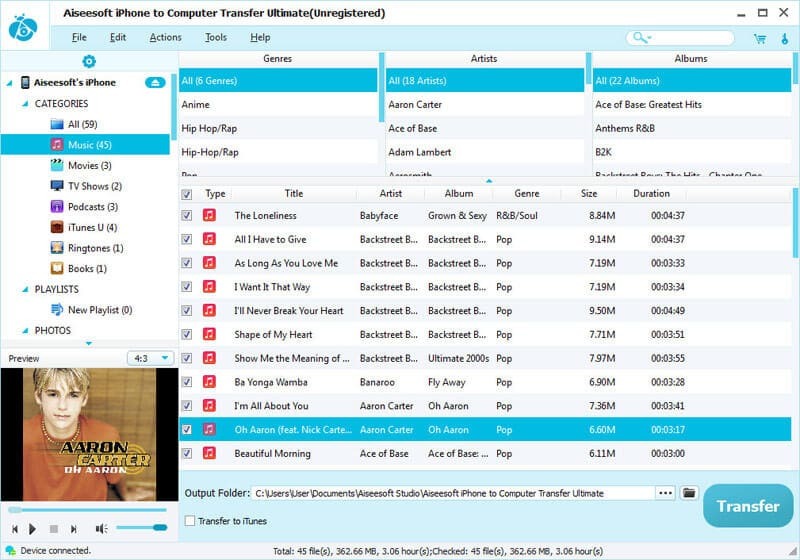 The built-in player of Aiseesoft iPhone to Computer Transfer allows users to preview the iPhone video and photo effect. Once you connect your iPhone to computer, this iPhone transfer will show you all iPhone info, including picture, type, capacity(used and available space), version number, serial number, and format.